Adware programs like ViperOut are usually a software package that renders commercial advertisements in order to generate profit for its creators. The point with adware apps is that they are seldom genuinely malicious. ViperOut and other similar programs fall into the gray category because they are not exactly there to infect you with malware, but at the same time, no one can guarantee they won’t do it. Due to the fact that it is hard to determine whether adware program will remain docile, you are strongly recommended to remove ViperOut immediately. Perhaps you do not even know how come ViperOut is on your computer. Most of the time, users do not remember having installed adware on their systems. That is because adware programs come bundled with freeware, and users do not notice how ViperOut, or any other adware app for that matter, are set up. The next thing you know, there are tons of commercial ads on your browser, and you are constantly attacked with various coupons and discount offers on a number of online shopping websites. Needless to say, you should stay away from anything offered to you by ViperOut. This adware program may not be malicious, but trusting its ads would not be a good idea. You have to understand that you are the one who installed ViperOut. This program comes from the SuperWeb adware family, so it cannot be downloaded directly. No programs from this group (including Fact Fire, Malt Mark, Rad Rater, etc.) have direct download links on their websites. Although ViperOut has an official homepage via viperout.net, the download button does not work. Hence, it is clear that the program is distributed bundled with freeware. 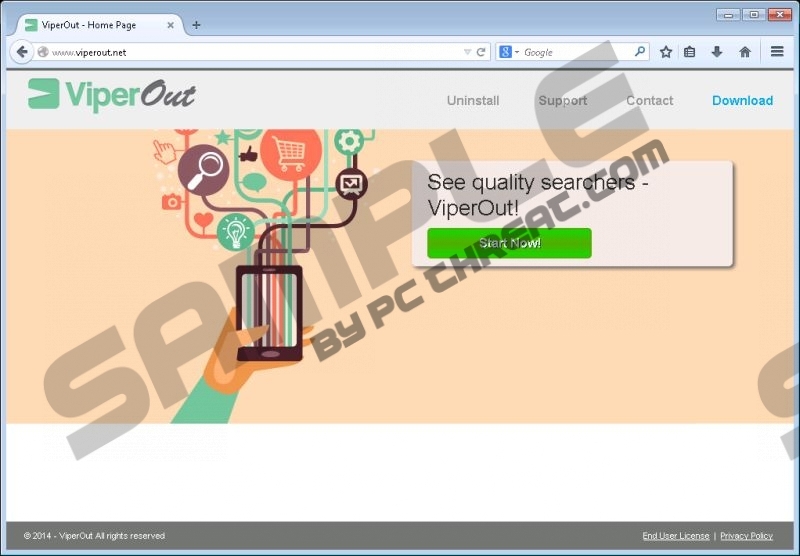 When ViperOut enters your system, it adds extensions to Mozilla Firefox and Internet Explorer. The main homepage claims that ViperOut works on Google Chrome too, but this browser is known to block the extension on security grounds. This adware program is often considered too intrusive and obnoxious, so the newest Google Chrome versions block it. ViperOut is definitely annoying because it shows an extensive number of commercial advertisements, most of which contain unreliable content. Since ViperOut is very vulnerable to third-party exploitation, you need to ignore all the ads provided by ViperOut and get rid of it at once. Do not forget that having ViperOut on your computer also means that there are probably countless of other potential threats on-board. Run a full system scan with the SpyHunter free scanner to determine which programs must be removed right now. Terminate ViperOut and do not hesitate to invest in a licensed computer security application. Select Uninstall a program and remove ViperOut. Open Uninstall a program and remove ViperOut. Go to Add or remove programs and uninstall ViperOut. Quick & tested solution for ViperOut removal.